The original plan was to go to Bondi today but the cool, damp cloudy weather that no-one associates with Sydney has continued, so I spurned the sand and kept it cultural, mainly. The good thing about staying in Chippendale is that there's a lot that's within walking distance - even downtown, if you're keen - so it was only a few blocks to the Powerhouse Museum. No prizes for guessing the original use of the venue, but it does mean that there are big, high spaces for the exhibits. The main attraction for me this time though was in a series of darkened rooms: six Egyptian mummies, a travelling exhibition from the British Museum. It was a combination of ancient and modern, with 3D CT scans showing what was beneath the wrappings at several levels right down to the bones. The deceased had lived up to 3,000 years ago, which in itself is pretty mind-boggling, and I was amazed as usual by the technical expertise shown by the jewellery and carvings: challenging to reach that standard even today. There were toys too, and make-up, and guesses at the stories behind each body. It's only a temporary exhibition, but there is of course plenty else to see that's permanent - some of it kind of unexpected. Like the big display of contraceptives in their original wrappings, the very suspicious 'Relax-o-Matic' with a smugly knowing woman on the box, a mortuary table, a post-cremation ash grinder (originally designed for coffee beans), an iron lung machine, a torpedo for delivering medicines from the Flying Doctor planes. And there was a really interesting exhibition about Anne Kellerman, who I'd never heard of, but who was a fascinating combination of vaudeville star, actor, swimmer, and pioneer for women's health and fitness, and water sports. She popularised the one-piece swimming costume. And swam the Channel. Next we visited Alexandria, another city district I'd never heard of, beyond Redfern, which Jess recommended yesterday. Specifically, she recommended the Grounds of Alexandria which, we discovered, is a former factory site surrounded by industrial and commercial buildings. 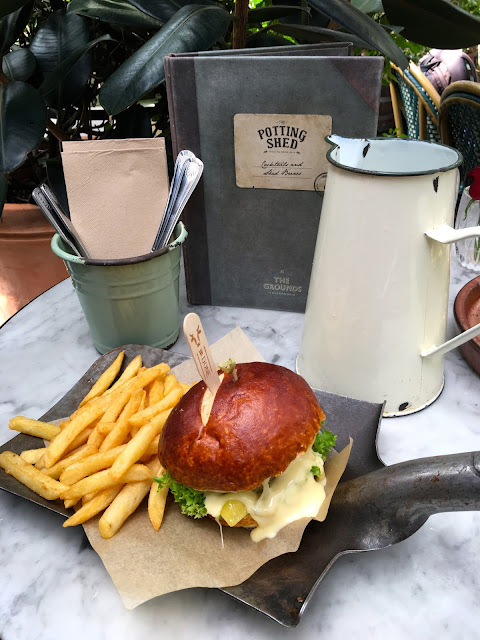 It's old and brick, with a chimney, and inside its grounds is a coffee grindery (hence the name), a bakery, bar, deli, and several cafe/restaurant operations, all looking as though they've been plonked down in a garden centre. There are plants everywhere. It's really, really lovely - and I decided that, even before I found the little farm with its hens, sheep, goat, pig called Kevin Bacon, and Fluffy the macaw. 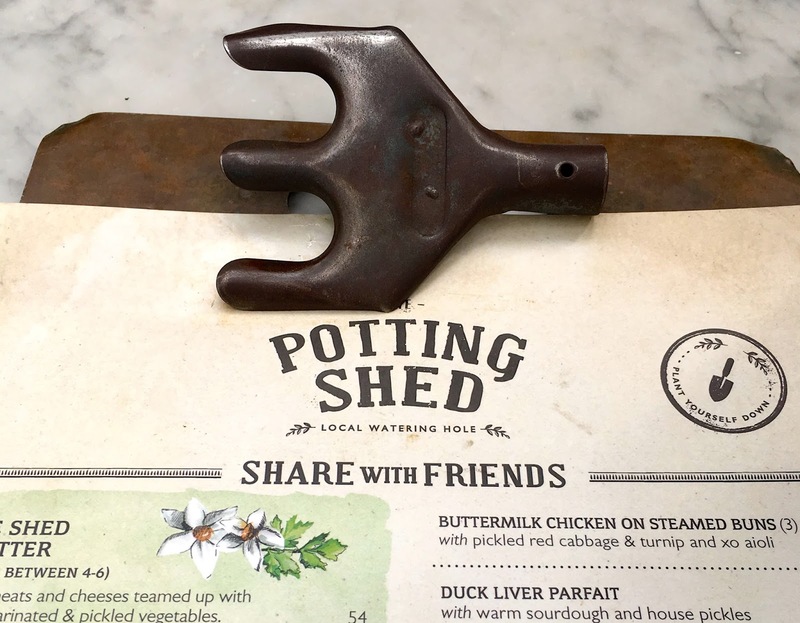 We ate at the Potting Shed, where everything is garden-themed - the burger served on a shovel blade, the cutlery in a little metal bucket, the menu clipped with a hand fork. It's fun. And the food was good, too - slow service, but there was so much to divert us, it didn't matter at all. Gorgeous place - and very popular. 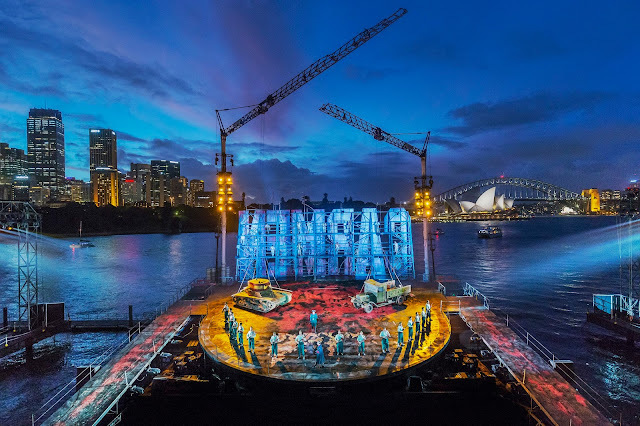 And then, for our final night in Sydney, we went to the opening night of Handa Opera on the Harbour, which takes place at the edge of the Botanic Gardens on a pop-up (actually, on piles) stage over the water at Mrs Macquaries Point. The setting is gorgeous - just across the little bay is the Opera House, the Bridge and under it the lights of Luna Park, and all around the lit-up skyscrapers. The opera was Carmen, and the name was spelled out in red lightbulbs across the backdrop of the stage, making everything look even more Hollywood-artificial than ever. There was a red carpet when we arrived, and lots of people were dressed up in bow ties and long dresses (not the same people) so we scurried along it in our ordinary clothes to take our seats with the other plebs. There were various dignitaries swanning it in the Platinum Lounge at the entrance, one of them our recently-resigned PM John Key and his wife - but everyone sat on the same hard plastic chairs when it began (though they all trailed back with red cushions after the interval). It's a good one for the opera novice, with some real ear-worm songs, and I enjoyed it. Even the passing shower didn't dampen everyone's spirits (though there was a great rustling of plastic ponchos) - nor, fortunately, did it endanger the performers on their treacherously sloping, circular stage. They were good: there was energetic dancing, some parading about, even a bull fight, but no-one fell over despite the women's high heels, or slid into the water (though there was a life-saver listed in the programme). It was a magical way to end the trip. And the monster possum that strolled nonchalantly across the road under the lights as we queued for a taxi after? The final touch of Aussie insouciance.